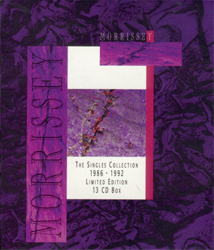 This box set released in November 1992 contains Morrissey's first 13 UK cd-singles: "Suedehead", "Everyday Is Like Sunday", "The Last Of The Famous International Playboys", "Interesting Drug", "Ouija Board, Ouija Board", "November Spawned A Monster", "Piccadilly Palare", "Our Frank", "Sing Your Life", "Pregnant For The Last Time", "My Love Life", "We Hate It When Our Friends Become Successful" and "You're The One For Me, Fatty". There is a typo in the title, the singles were actually released from 1988 to 1992. This is only a semi-official box set as the cd-singles are official releases, but they were not packaged together by EMI. View here and here. For the 1998 Christmas season EMI France put together a budget 3-cd set by packaging together the UK edition of "Viva Hate" with Holland editions of "Bona Drag" and "Vauxhall &I". View here. This box set combining cd copies of Morrissey's first ten UK singles has its own discography page here. 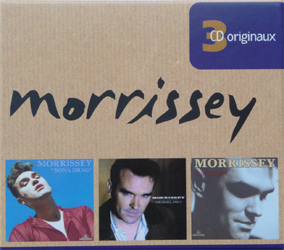 This box set combining cd copies of Morrissey's subsequent nine UK singles has its own discography page here. This budget 3-cd set released in 2000 pairs the UK Parlophone editions of "Bona Drag" and "Vauxhall &I" with the Europe HMV edition of "Kill Uncle". View here. This budget 2-cd set released by EMI in October 2002 combines the Holland editions of "Bona Drag" and "Your Arsenal". This box set combining 7" copies of Morrissey's first ten UK singles has its own discography page here. 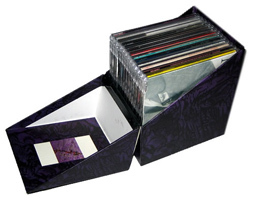 This box set combining 7" copies of Morrissey's subsequent nine UK singles has its own discography page here. 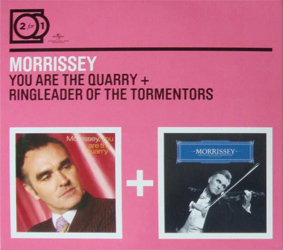 This budget 2-cd set combining the standard European editions of "You Are The Quarry" and "Ringleader Of The Tormentors" was released by Universal in 2010 (view Europe edition here). The Mexican edition is similar but it also has the words "2 Al Precio De 1" on the front (image needed).